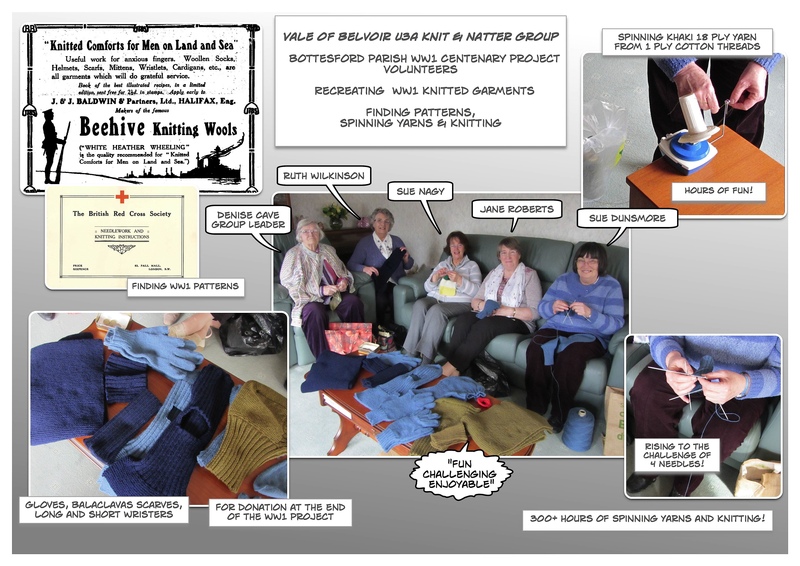 In contributing to the Bottesford Parish 1st World War Centenary Project the Vale of Belvoir U3A Knit & Natter Group in North East Leicestershire produced garments based on WW1 patterns. Meeting monthly they searched for patterns, sourced and spun yarn and then set about recreating a whole selection of garments similar to those sent to soldiers at the front during WW1. Denys Cave, with the assistance of Sue Dunsmore, coordinated the collective effort of Ruth Wilkinson, Sue Nagy, and Jan Roberts in over 300 hours of research, knitting and spinning yarns! Working from patterns published by the American Red Cross Society they rose to the challenge of interpreting unusual instructions, spinning 18 ply khaki knitting yarn from multi-coloured I ply strands and learning to use 4 needles. The whole experience was ‘fun, challenging and enjoyable’. The garments generated much interest and admiration at the ‘Bottesford and the Great War’ Exhibtion & Concert held in St Mary’s Church, Bottesford, on the 18-19th April 2015. When the Bottesford Parish WW1 Centenary Project is completed all the garments will be donated to local causes.